New book, 96 pages. 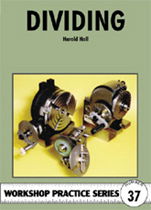 Dividing by Harold Hall explains how radial work on a metalworking lathe, such as the cutting of gear wheels or the drilling of holes on a set radius, calls for a method of precisely spacing the cuts. The principles underlying this aspect of engineering are explained in depth in this book. This item was added to our catalog on Saturday 26 May, 2012.